After some basic articles about Couchbase installation, Node.js integration. Let's now dive into a more complete example: a chat application. I won't go in all the detail of the design of the Node.js application. 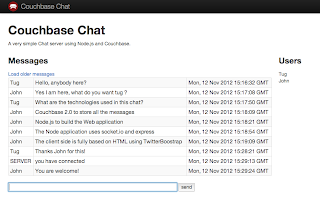 You can find many example of Node based chat application. I prefere to focus on how I have design the persistence using Couchbase more than the application itself. If you want me to give more detail about the complete application feel free to drop me a message/comment and I will do it. What are the challenges with persisting the messages? Storing the information is quite easy, just "dump" the message information in your database. The challenge is more around the fact that user want to access the history of the messages. So the key point here is how to store the information in a way that it is easy to get back in a sorted fashion. 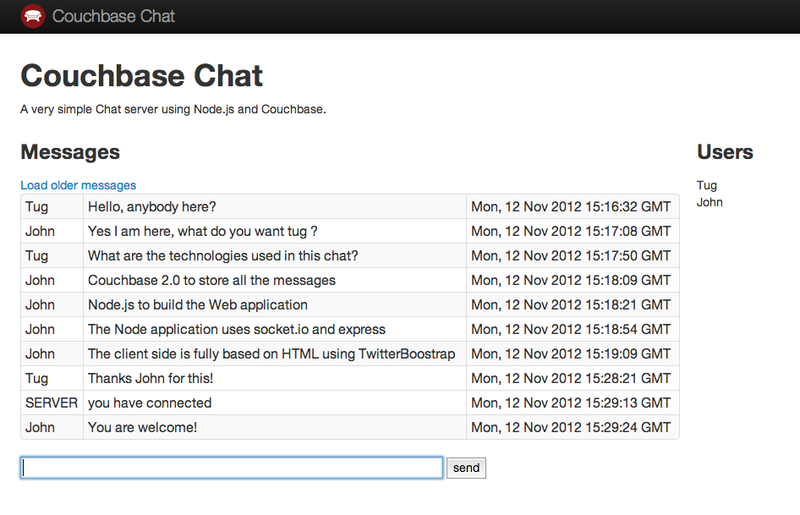 Let's now see how Couchbase is used in the chat application. The key is based on the timestamp and the user name : 1349836768909-Tug. I am adding the user name to be sure that the key is unique. Like that I do not have to manage conflicts. The postMessage event is called by the client when the user post a new message. A new message object is created with : a type, the user, the message itself and a timestamp. At this point your application work perfectly, all the connected user will see the new messages since they are sent by the server as soon as they are created. But it is not possible for a user to navigate in the chat history and see older messages. As you can see the id of the document (timestamp-username) is automatically inserted in the response. When the client send a showHistory event the application capture this event and call the view with proper parameters to send back the list of messages to the client. Ask the view to update the index before returning the rows using the stale=false parameter. Use startkey parameter if the client send a specific starting point. On line 7, the view "chat", "message_history" is called using the Node.js SDK, with the options object. We have an interesting point to discuss, the view is used only to return the list of keys, and then do a multiple get call with the list of keys. This is most of the time better than returning too much data in the view. In this first option, the application is using a view to get the message history. This is great, the only thing to look at closely is the fact that this approach uses index and the indexes are stored on the disk. So you need to be sure that the message is saved and the index updated before printing the message in the history, this is why the stale=false is required in this specific scenario. Let's see now how it is possible, with few changes in the the application, to do the same without using a view and only use the in memory keys. Using this approach the application only use the keys that are all in the memory of the server (memcached). Once the message object is created (line 3), the application increments a value chat:msg_count that will be used as message counter (line 9). Note that the Node Couchbase SDK will automatically create the key if it is not present when the incr() method is called. Retrieving the older messages from Couchbase is very easy since all the message contains a unique and sequencial id. The showHistory event just need to create a list of keys based on the correct number and get them from Couchbase. The line 3-5 are used to create an array of keys, and then in line 6 this array is used to do a multiple get and send the messages to the client using socket.emit. Here the logic is almost the same that the one used in the previous example. The only difference is the fact that we do not call Couchbase server to create the list of keys to use to print the message history. As you can see when working with a NoSQL database like any other persistence store you often different ways of achieving the same thing. In this example I used two approaches, one using a view, the other one using the key directly. The important thing here is to take some time when designing your application to see which approach will be the best for your application. In this example of the chat application I would probably stay with the "Key/Counter" approach that will be the most efficient in term of performance and scalability since it does not use secondary index. i need to develop chat application for my social networking site , like facebook chat...and i need to provide online friends,contact list features and also chat history should store in couchbase database ..please give me any idea how to do this ? does the code on git hub complete.